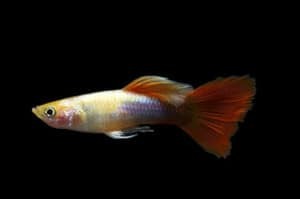 Place of Origin: Originating from South America, the Guppy was originally found in Mountain Streams as well as brackish rivers. Wild populations of Guppies can now be found around the world for example Venezuela, Trinidad, Barbados, Singapore and the USA. Typical Tank setup: Guppies are a very popular aquarium fish, and don’t require anything special. A peaceful community aquarium with at least 2 females should be kept to each male, so they aren’t continually harassed. Also for the same reason, a tank housing both male and female guppies would ideally contain plants so the females can get out of the way of the male. 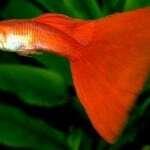 Compatibility: Peaceful community tank mates like Platy’s, Mollie’s and Tetra’s. Water chemistry: pH 6.8 to 7.5 – . Although water chemistry is not critical for these fish, they prefer slightly acidic water. Salt is optional, only some, not all wild guppies live in brackish conditions. 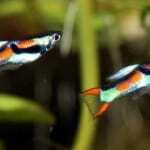 Feeding: Guppies should be fed once or twice a day. It is very important not to over-feed your Guppy. All food should be consumed after just a few minutes. If not, you are feeding your Guppy to much food in one serving. 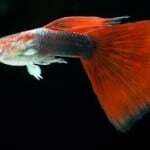 You can buy flake food specially made for tropical fish, such as the Guppy in your fish store. 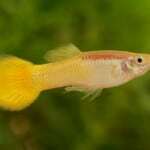 A flake food diet is a good base for the Guppy, but should ideally be supplemented with live food. 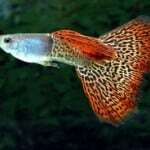 Your Guppy will survive on flake food alone, but the live food makes the Guppy more well-nourished and healthier. Live or frozen Brine Shrimp is a popular Guppy fish food since Brine Shrimp is very easy to produce at home. 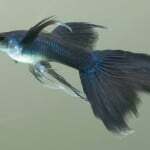 Bloodworms, Micro Worms, Fruit Flies, Mosquito larvae, Daphnia and chopped up Earthworms are other examples of suitable food for your Guppy. Breeding: This fish is amongst the easiest to breed, in fact, it can be difficult to stop them! The females are nearly always pregnant, and can store sperm for up to 6 months. She will also give birth to between 10 and 40 fry every 4 to 6 weeks. One of the best methods for getting plenty of healthy strong fry is to set up a breeding tank. A 10 Gallon tank is easily large enough, with plenty of plants for fry to hide in, such as Java Fern or Java Moss. Many people use breeding traps or nets in their community tanks. These are small plastic or net containers that float in the tank. These can easily stress adult fish, and lead to aborted pregnancies or even death. If you must use them, please only put the female in just before she is due to give birth, or even better, wait until the fry have been born and then catch and add them the trap. If you are using a plastic trap, then remember to change the water in it regularly. Guppy fry are easy to raise. At least a couple per brood would probably survive in a planted community tank. But if you want to save more of them, then you could use a separate “growing on” tank. A bare 10 gallon tank again would be enough. Just use an air powered sponge filter so the fry don’t get sucked in. You can feed them a variety of things such as liquifry for the first couple of days, then move up to fine crushed flake foods. Baby brine shrimp would also be a welcome addition. Remember to keep these tanks very clean as fry are more susceptible to pollutants than adult fish, so a small water change every day will be necessary, and also remove any faeces or dead fry. 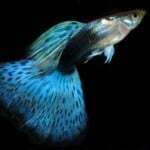 Additional Information: These fish are undoubtedly one of the most popular in the hobby. They come in a massive variety of spectacularly coloured strains. Many fish stores recommend these fish as suitable for first time fish owners. They are easy to look after, but will usually struggle with a cycling tank, and would probably die, so they should not be added to a tank until the cycle has been completed. 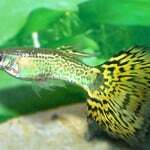 This entry was posted in Profiles Tropical All Fish, Profiles Tropical Livebearers.